How I Gained It: Ever since I was little I was overweight. I really put on the weight when my parents got divorced, due to my dad’s alcohol addiction when I was 10. My mom worked two jobs to help make ends meet, and I would eat while she was gone because I was sad. I was teased at school from elementary through high school by kids because of my weight, which just made the vicious circle go around. I never really realized how out of hand it was until my first son was born. Breaking Point: I was always struggling to carry the baby places. Even though he was so little, I still didn’t feel like I held him close because there was so much extra fat between us. I never felt bonded with him. My child was a huge motivator, but soon I became my own motivation. 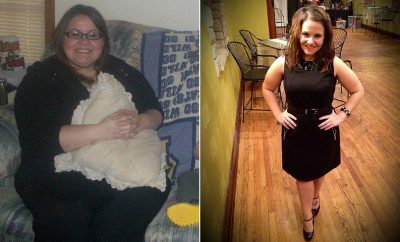 How I Lost It: I lost the first 20 pounds just by changing my calorie intake and trying to make healthier choices. I used the tracking tools on SparkPeople.com. Then, I purchased some exercise DVDs. The first DVD I purchased was from “The Biggest Loser”. I struggled to get through the first 15 minutes, but continued to use them three to four times per week. There were times that I wanted to give up, but I didn’t. Soon, I purchased more DVDs to add to my rotation and began to see results. Before I knew it, I started to love working out and even looked forward to it. Instead of turning to Swiss cake rolls to deal with stress, I turned to sweat. In the spring of 2008, I heard about a program called Couch to 5K. I thought to myself: “But you hate to run, why would you want to do this?” I realized that the old me hated to run, but I didn’t know if the new me hated it or not. I printed off the plan and started to run three times a week. At 230 pounds, running for even one minute was hard. As the weeks went by, running got easier and easier, even as my time and distance increased. I ran my first 5K in June 2008. Crossing that finish line was one of the biggest accomplishments in my life. I may not have been very fast, but I ran the entire distance. I felt proud that my hard work and dedication came full circle. 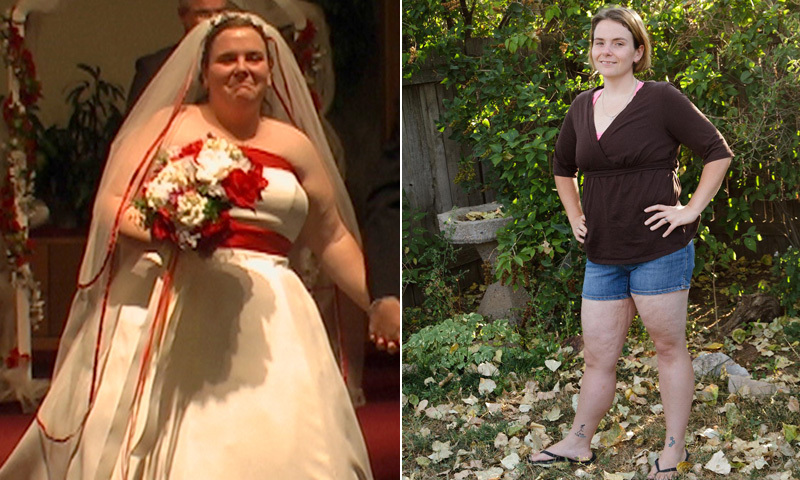 RELATED: "I Lost 227 Pounds"
That September, we found out that I was pregnant for the second time. This pregnancy was totally different then my first. I didn’t go into it thinking: “I’m eating for two!” I went into it thinking: “I will gain a healthy amount of weight, and exercise as long as I can,” which I did. After having Son #2, all the weight I gained came right back off. However, instead of being motivated by this, I started to let old habits creep back in. I had this brand new baby, plus an 18 month old and I lost myself very quickly. Instead of dealing with stress in a positive way, I turned to food. My weight slowly started to creep back up. At that time, I found out that I was pregnant with our third child. It was really a wake-up call to me. I decided that if I was going to be around to watch my kids grow up, I was going to need to lose the weight and keep it off. So, I started setting goals, tracking my food and focusing on healthy eating and regular exercise. The spring of 2011, my strength was really tested. One of my biggest supporters was diagnosed with cancer in January, and it shook my life. My uncle treated me more like a daughter then a niece, and always believed in me. He came to my first race, and would often ask me about my training for the next races. I remembered when I ran a 10K in May of 2011 he wrote me a note about how proud he was that I had made the changes to live a long, healthy life. I dealt with his cancer by lacing my shoes and running, instead of crumbling to the ground and stuffing my face with Oreos. There were days that I ran just to get away and let my mind clear, and there were days that I ran and tears streamed down my face. I ran every mile for him, because he believed in me even when I didn’t believe in myself. That July, he passed away, and I ran a 10K in honor of him. I read his card before every race just to remind me that he believed in me, and that I will run for him, always. After I was able to regain my focus, I went back to the basics of tracking food and consistent exercise to start losing weight again. For almost a year, I logged 10 to 20 miles a week running. 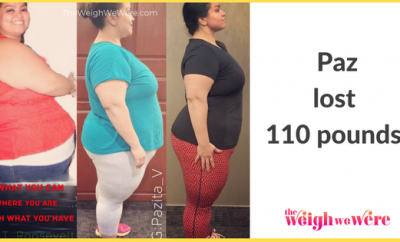 Before long, I stopped seeing results and hit a plateau. I needed to try something different to challenge my body. Then I found the world of CrossFit! I learned quickly about my own competitive nature, about making friends, about building confidence, about pushing past fear of what others think, and that I love pull ups (as crazy as that might sound)! I wanted to be confident around my children — I never wanted my kids to think that their mom was “the fat one.” Now, I don’t feel ashamed to be in public with my family. I feel better, stronger and more outgoing. And as for my DVD library … you name it, I probably own it. At least that’s what my husband thinks! My condolences for losing your uncle and my kudos for finding a healthy you! Beautiful I’m so glad for you. Awesome story!! Thank you for sharing!! Thank you for motivating me!! That made me cry! Good for you – you look great! I am an emotional eater…..I need to believe in myself just as you did. I haven’t been the same since my 2 year illness. Going on my third year , I have gained 30 pounds. I have to get my fit back….but it’s tougher….turning 50 other medical issues have creeped in. Thank you for sharing your journey and congratulations! I struggle with emotional eating. Great job you go girl! Great inspiring story Danielle. 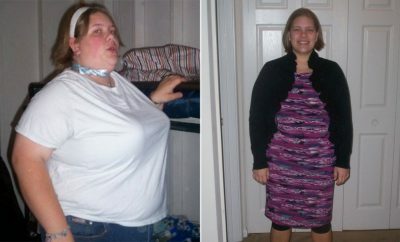 I have lost 60pounds already n I am so encouraged by your story. No giving up. Sad to say emotional eating is my problem! Congratulations, what an awesome story of hanging in there! I’m inspired! what a wonderful story! keep on inspiring! way to go!!! Congrats. Your journey was inspirational. Move forward to your new life. What a great story. Very inspirational. Man thats so awesome!!! I’ve lost 60 so far and still on my way! Got 60 more to go! 🙂 this just inspires me so much more! Thanks for sharing! I am so proud of you after reading this. I fit into the category of hating to run. I’ll find any excuse not to exercise or eat healthy. But I want to lose weight and I will lose it. I think I’m going to start printing out some of these inspirational stories and keep a binder for when I get discouraged. OH MY! So wonderful! Congrats! You have inspired so many people. You are amazing!